iOS 8 has released and its time to save your data in your iDevice and upgrade to iOS 8 without deleting your content. iOS 8 has brilliant features in respect to its design, User interface and other premium features. Learn about top 5 features in iOS 8. The main challenge in iOS 8 is is size. The download is very huge and even many has complained in there data getting deleted. How to back your old phone and transfer to your new iOS device is posted earlier. iOS 8 occupies, a ton of storage on your iPhone or iPad. As per itunes, the size of iTunes is 1.2GB, but the download size needs 6.0GB of free storage to be completed. As a result, people are worried to delete pictures, apps and music in order to make room for iOS. The previous version, iOS 7, only required 2.9GB of space to install, so the added storage requirement has created greater challenge in some users to empty few more space for the new iOS 8 update. Note: Depending on which model you have — and the last time you updated the iOS — how much space you’ll need in order to download the software will vary. So before your delete everything you save, there is a simple trick you can save your content with a small trick. Sync your iPhone or Ipad to the compute and download iOS 8 directly from there. This will prevent using of all the space in your iPhone or Ipad. After downloading iOS 8, you can manually transfer the new software back to your device, Updating via PC or Mac. This is more reliable way to upgrade to iOS 8, when you compare OTA upgrade, which is performed directly. 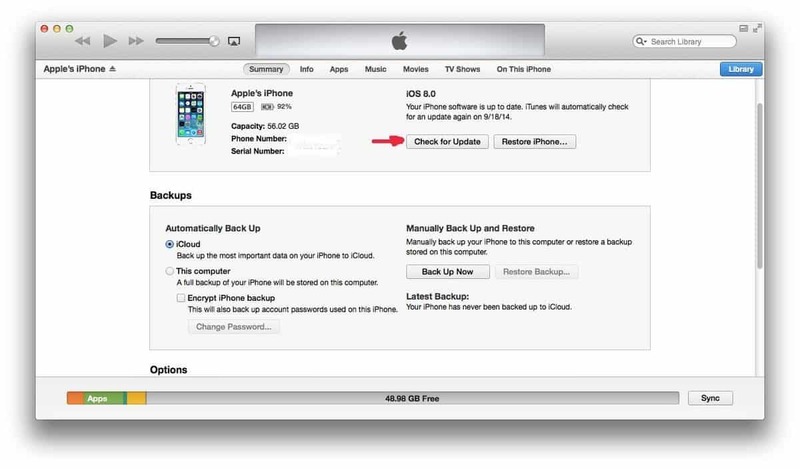 If you’re taking this alternate route, be sure to select “check for update” when the prompt pops up on iTunes — not “restore iPhone.” The latter option will indeed wipe all content from your device. For More information how to transfer backup from your old Iphone to iPhone 6/ iPhone 6 Plus Read more.